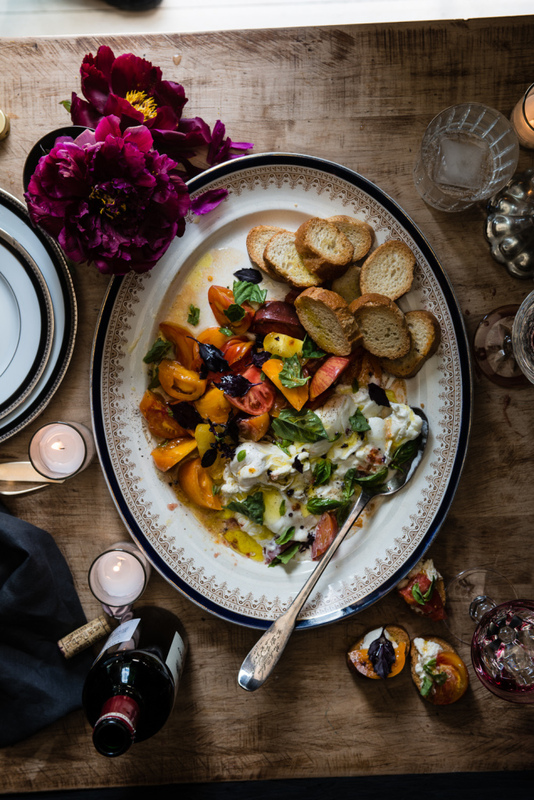 I’m not sure there’s anything better than an heirloom tomato with a dollop of burrata cheese. This is my deconstructed version of a classic Caprese salad. It is more than just an appetizer; on a lazy summer night, it’s dinner. I grill or pan-fry pounded chicken breasts with fresh herbs and top with this heavenly mixture. Combine the tomatoes, ½ cup olive oil, garlic, sea salt, and pepper in a large bowl. Mix gently to blend. Cover and set aside at room temperature for up to 1 hour to allow the flavors to blend. Position the rack in the center of the oven and preheat to 350F Arrange the baguette slices in a single layer on 2 large baking sheets, brush with remaining 2 tablespoons of olive oil. Bake at 350 for 6 minutes. On a large platter, spoon tomato mixture next to burrata and toasted baguette slices. Garnish with basil leaves.